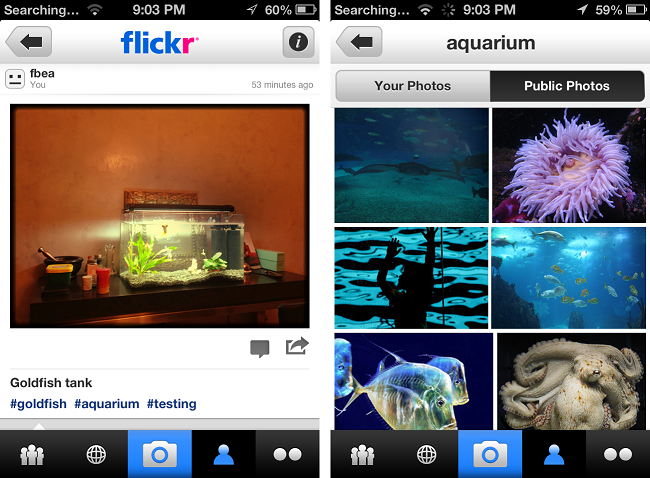 While you were out Instagramming your weekend fun times, Yahoo silently pushed out an updated version of Flickr for iOS that includes a key “new” feature: hashtags. Flickr for iOS users – whoever they are – will now be able to label their photos just as Twitter (and Instagram) users have for years. Flickr currently has about 6 billion photographs and counting – and many of these photos already have hashtags added to them, thanks to Twitter users and Instagrammers’ habits spilling over into Flickr. Now, however, Flickr app update means hashtags added inside of a photo’s description are now clickable, and clicking through these tags will open up a page exclusively stocked with photos that sport the tag. If you’re not familiar with hashtags already, you’ll find these useful in certain situations. Hashtags throw all relevant media associated with the tag into the same bucket. So in instances where you might want to check out all the crazy SXSW photos, you’ll just need to click on #SXSW, and all the SXSW shenanigans forever preserved on Flickr are just a click away. The usefulness of hashtags for Flickr fans probably isn’t the reason Yahoo added them in, however; there’s also money to be made from topic-specific advertising. For example, Flickr could experiment with trending hashtags just as Twitter does, which the photo app could monetize through in-app promotions. Despite the fact that Twitter has used hashtags since 2007, other companies are just now jumping on the #bandwagon. Even Facebook has caught the hashtag bug, with the social network reportedly set to roll out the feature sometime soon.